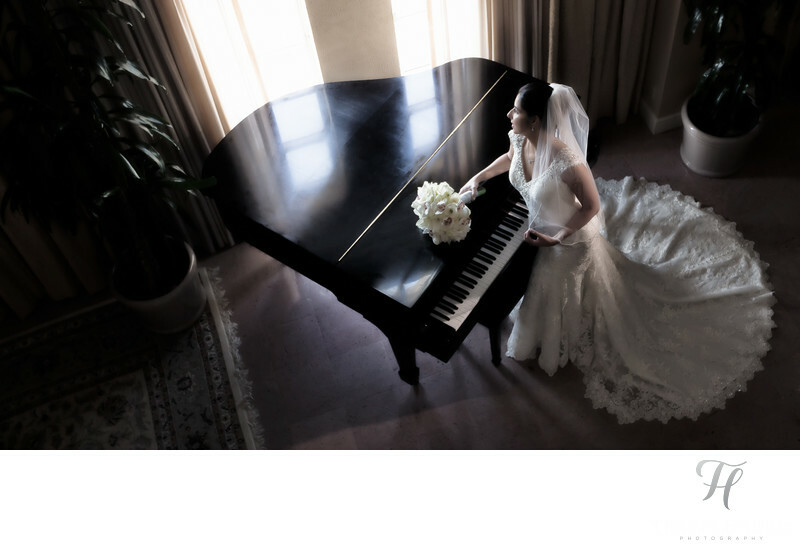 I hope that you find some of the Best Hyatt Regency Wedding Photos on my site. Here is one that is very unique in composition.. Looking down is always a great vantage point for creative shots. It can be very hard to “pull it off” however, and I always try to shoot things in a way that makes sense, and not just for the sake of doing it. In this case, I posed Jackie by the piano and told her to think about “the rest of her life” while looking at the window. I had already shut down most of the window light in the room to create the drama this type of shot really calls for, and then once I was in position on the second floor of her suite, I told her to pull down on the end of her veil so her arm, had something to do and was not just by her side. This shot was lit by using both the window light, and also a small off camera light hand held by my assistant camera right. This gives the dimension, and mood I was after, and in the end makes for a shot that I think would look great printed on the wall in a nice frame, or a nice full spread in a wedding album. You can see the rest of this wedding over on my blog. Location: 400 South East Second Avenue Miami, Florida, USA, 33131-2197.